In September, Jakob Hals and two friends made a 3,000-mile round trip from Minnesota to Texas just for a chance at Trinity River’s legendary alligator gar. These living fossils are among the largest freshwater fish in North America, and can grow up to 10 feet long and weigh as much as 300 pounds. Even an 18-hour drive could hardly diminish the anglers’ enthusiasm, and their patience paid off with a massive fish measuring 7.5 feet and estimated to weigh over 200 pounds. “This fish was the true river monster we came down to Texas to catch and we happened to get it on our second day of the trip, just unreal,” Hals wrote to in-depthoutdoors.com. The anglers were using eight-foot medium heavy rods and spinning reels spooled with 150-pound braided line. Alligator gar may be seen by many as passive, but every once in a while anglers will get a taste of what this predator is capable of. Hals said that it took three men to wrangle this particular gar onto the boat after chasing it to shore. Luckily, some passing anglers were able to snap a quick picture of the behemoth gar before it was released back into the water. Hals and his friends may never know the true weight of the fish they released, but it is entirely possible that it was not too far from the world record itself. 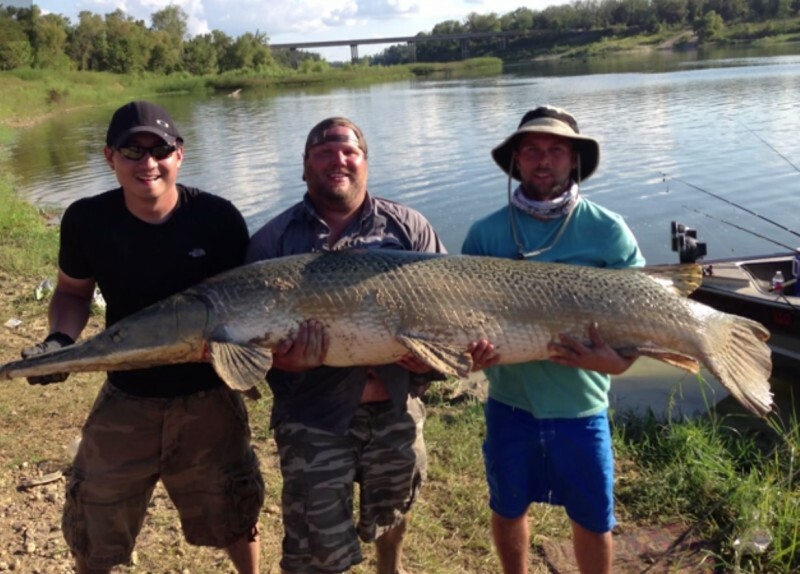 According to the International Game Fish Association, the record for the heaviest alligator gar caught on rod and reel belongs to a 279-pound beast from the Rio Grande. That record has stood for more than 63 years since Bill Valverde caught it in 1951. At that time, popularity in fishing for alligator gar was still relatively low as the fish was seen as a nuisance speices that threatened other, more attractive game fish. Since then however, alligator gar has enjoyed a change in public perception. Wildlife departments once targeted the fish for elimination, but now gar are highly prized by both anglers and bowfishermen. Alligator gar are also vital to the ecosystems that they inhabit, and are now found in many federal hatcheries. However, nowhere is the alligator gar more ripe for fishing than in Texas. Hals and his team closed out their fishing expedition with an additional seven gar, although none came even close to their 200-pounder. The trip was, in their words, one that needs to be on every fisherman’s bucket list.